The iPod, Apple's pocket-sized music device, was first released to the consumer market in 2001. Two years later, the company launched the iTunes Music Store, offering an innovative combination of software and hardware for music listening. With nearly 370 units sold worldwide since 2006, the iPod was a dominant product within the digital music player market, and is considered one of Apple's biggest successes. The market for portable music players, however, has slowed down in recent years, due the increasing popularity of smartphones. Along with other features, smartphones also have the capability to play and store music, digital music players' main function. As a leader in the digital music player market, Apple’s own sales figures essentially follow the existing overall market trend. iPod sales figures have decreased over the years, despite the consistent sales peak in the holiday season at the end of the year. The declining sales had a direct impact on the iPod's share of Apple’s total revenue, which has significantly dropped over time. 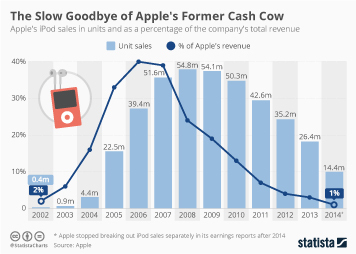 In the first quarter of 2009, iPod revenue accounted for nearly 29 percent of the company's revenue. By 2014, this share was reduced to less than one percent. Yet, Apple's overall revenue was not impacted by declining iPod sales, thanks to the launch and growth of other products. Introduced to the consumer market in 2007, the iPhone has thrived in the market. It has been suggested that the development of the iPhone has led to the cannibalization of the iPod, and that Apple is effectively making one of their own products obsolete. The iPhone’s share of Apple’s total revenue has rise from nearly 25 percent in the first quarter of 2009 to almost 70 percent in the first quarter of 2016. Besides the rise of smartphones, the digital music market has undergone major changes over the years. Consumers have been changing their habits and turning to other ways to listen to music, such as streaming. With that in mind, Apple has been exploring new services such as iTunes Radio, an ad-supported music streaming service, and iTunes Match, which allows the user to store music in the iCloud.